These graphs, known as Riemann surfaces, describe the energy-momentum relationships of electrons in the surfaces of exotic new materials called topological semimetals. Discovered just five years ago, topological semimetals are materials with unusual physical properties that could make them useful for future electronics. In the latest issue of Nature Physics, MIT researchers report a new theoretical characterization of topological semimetals' electrical properties that accurately describes all known topological semimetals and predicts several new ones. Guided by their model, the researchers also describe the chemical formula and crystal structure of a new topological semimetal that, they reason, should exhibit electrical characteristics never seen before. "Generally, the properties of a material are sensitive to many external perturbations," says Liang Fu, an assistant professor of physics at MIT and senior author on the new paper. "What's special about these topological materials is they have some very robust properties that are insensitive to these perturbations. That's attractive because it makes theory very powerful in predicting materials, which is rare in condensed-matter physics. Here, we know how to distill or extract the most essential properties, these topological properties, so our methods can be approximate, but our results will be exact." Semimetals are somewhat like semiconductors, which are at the core of all modern electronics. Electrons in a semiconductor can be in either the "valence band," in which they're attached to particular atoms, or the "conduction band," in which they're free to flow through the material as an electrical current. Switching between conductive and nonconductive states is what enables semiconductors to instantiate the logic of binary computation. Bumping an electron from the valence band into the conduction band requires energy, and the energy differential between the two bands is known as the "band gap." In a semimetal - such as the much-studied carbon sheets known as graphene - the band gap is zero. In principle, that means that semimetal transistors could switch faster, at lower powers, than semiconductor transistors do. The term "topological" is a little more oblique. Topology is a branch of mathematics that treats geometry at a high level of abstraction. Topologically, any object with one hole in it - a coffee cup, a donut, a garden hose - is equivalent to any other. But no amount of deformation can turn a donut into an object with two holes, or none, so two-holed and no-holed objects constitute their own topological classes. In a topological semimetal, "topological" doesn't describe the geometry of the material itself; it describes the graph of the relationship between the energy and the momentum of electrons in the material's surface. Physical perturbations of the material can warp that graph, in the same sense that a donut can be warped into a garden hose, but the material's electrical properties will remain the same. That's what Fu means when he says, "Our methods can be approximate, but our results will be exact." Fu and his colleagues - joint first authors Chen Fang and Ling Lu, both of whom were MIT postdocs and are now associate professors at the Institute of Physics in Beijing; and Junwei Liu, a postdoc at MIT's Materials Processing Center - showed that the momentum-energy relationships of electrons in the surface of a topological semimetal can be described using mathematical constructs called Riemann surfaces. Widely used in the branch of math known as complex analysis, which deals with functions that involve the square root of -1, or i, Riemann surfaces are graphs that tend to look like flat planes twisted into spirals. "What makes a Riemann surface special is that it's like a parking-garage graph," Fu says. "In a parking garage, if you go around in a circle, you end up one floor up or one floor down. This is exactly what happens for the surface states of topological semimetals. If you move around in momentum space, you find that the energy increases, so there's this winding." 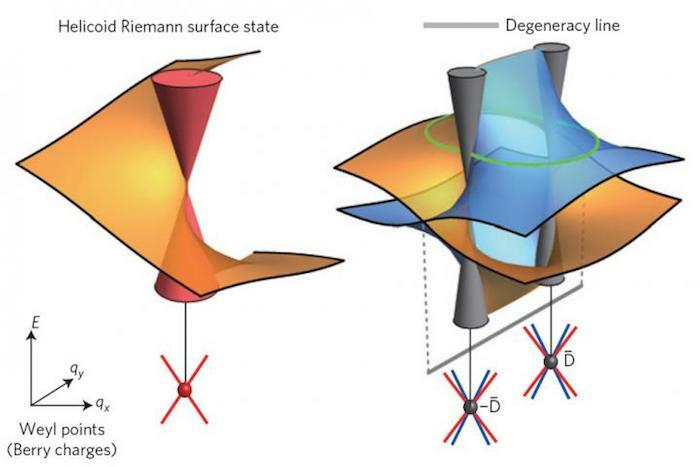 The researchers showed that a certain class of Riemann surfaces accurately described the momentum-energy relationship in known topological semimetals. But the class also included surfaces that corresponded to electrical characteristics not previously seen in nature. The momentum-energy graph of electrons in the surface of a topological semimetal is three dimensional: two dimensions for momentum, one dimension for energy. If you take a two-dimensional cross section of the graph - equivalent to holding the energy constant - you get all the possible momenta that electrons can have at that energy. The graph of those momenta consists of curves, known as Fermi arcs. The researchers' model predicted topological semimetals in which the ends of two Fermi arcs would join at an angle or cross each other in a way that was previously unseen. Through a combination of intuition and simulation, Fang and Liu identified a material - a combination of strontium, indium, calcium, and oxygen - that, according to their theory, should exhibit such exotic Fermi arcs. What uses, if any, these Fermi arcs may have is not clear. But topographical semimetals have such tantalizing electrical properties that they're worth understanding better. Of his group's new work, however, Fu acknowledges that for him, "the appeal is its mathematical beauty - and the fact that this mathematical beauty can be found in real materials."